CNS Canada — Farmers with flax in the ground should be pleased come autumn. Statistics Canada revised its seeded acreage estimate downward in late June and that, combined with lower carryout stocks and several other factors, should bring strong prices. StatsCan reported 885,000 acres of flax seeded in its June report, down from 1.04 million last year and 941,000 in 2016. The shortfall of about 100,000 acres compared to a year ago, combined with acreage declines in North Dakota, the key flax-producing region in the U.S., EU issues with flax from the Black Sea region exceeding maximum residue limits for pesticides and good Chinese demand should hold flax prices reasonably high, Thompson said. Brennan Turner, CEO at FarmLead, an online grain marketplace, said he too is bullish on flax. Flax posted price gains of four percent in June, he said, and he expects a continued steady performance. 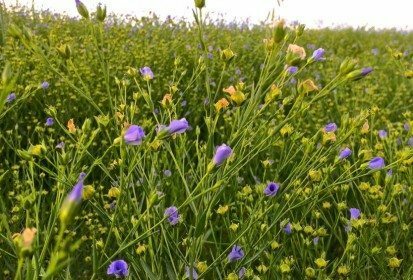 Flax stocks as of March were reported to be 327,000 tonnes, down from 417,000 at the same time in 2016. Turner added he’s heard concerns about the reliability of the U.S. market because that’s where a lot of the Canadian crop usually goes. But he said the supply/demand fundamentals remain positive. This year’s seeded acreage estimate marks a 29 per cent decline from the five-year average, he said. Thompson said that number includes the highly successful peak year in 2014, when farmers seeded 1.605 million acres. The numbers have come down steadily since. Many farmers saw strong prices the year before and flax seemed like a good economic decision. Two years later, lentils became the darling and flax acres fell to 941,387.